Gingham is a classic but it also seems to be a trend that is all the rage this summer. This was especially evident in the most recent new arrivals from J. Crew, which I absolutely love! (I picked up a gingham midi skirt from them last weekend, which sold out almost immediately.) Gingham, like a lot of prints, comes in different sizes and today I am featuring a blouse in a smaller print of gingham, which I hope will make it perfect for some fierce pattern mixing this summer! Today, however, I paired the gingham blouse with simple cobalt blue pants and my not so simple "desert storm" bag. Like I said, I can't wait to feature this blouse again with perhaps some more adventurous prints, so stay tuned and look for it on my blog in the near future! 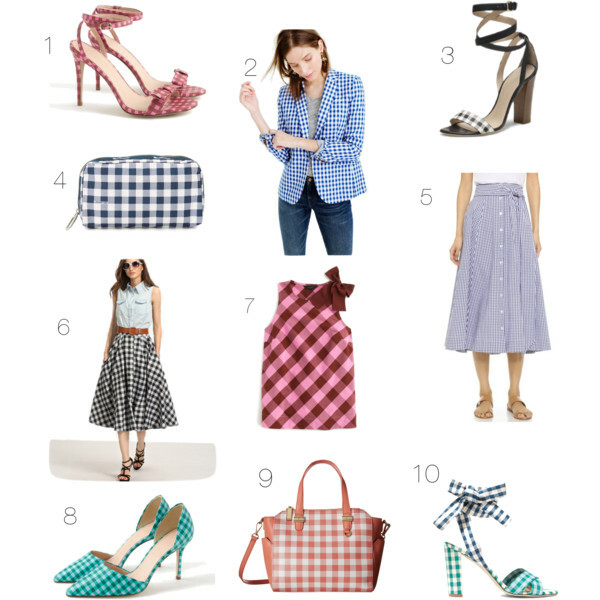 For those of you who are looking to get your fill of gingham this summer and take part in a classic with a trendy twist, I am featuring some of my favorite gingham pieces below that range from shoes, to jackets and cosmetic cases. Although my blouse above is black, I love all of the pale pinks and blue tones that designers are featuring for summer this year in the gingham print! Your gingham top is darling and I love your picks, especially the blazer and tie sandals! You look gorgeous in cobalt blue! That gingham shirt is gorgeous Katie and I love love that colorful LV Bag. It is beautiful and it is very you! As always lovely locations for the photos, too. I would love for you to linkup with me, today, Katie. =) A new linkup is up every Thursday. Come share your gorgeous style with my readers. Super pretty and love the bag with the outfit too. Thanks for linking up with Fun Fashion Friday and have a fab weekend! I love the ruffle details on the sleeves of that top, and how it really stands out against the cobalt pants. I don't have a lot of gingham in my closet, so I think I need to go find a few things!! That gingham blazer you picked... adorable.